Buddy Lee dolls were made for the H. D. Lee Company Inc. (Lee Jeans), a garment manufacturer in Kansas City, MO USA, originally from 1920-1962 as an advertising doll an in-store display doll wearing Lee clothing. Dolls can be composition (1920-1948) at 12 1/2" tall or hard plastic (1949-1960) at 13" tall, have molded lightly painted hair, painted side glancing eyes, painted upper eyelashes, painted closed watermelon mouth, jointed only at the shoulders, have black painted boots, dolls were dressed in original Lee clothes depicting various occupations. Clothing should have a Lee label tag. 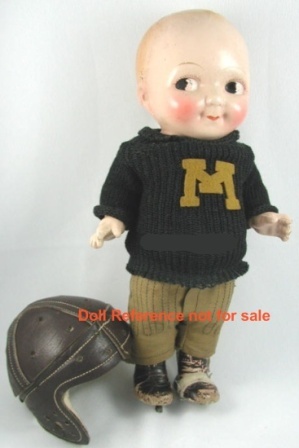 1920-1931 Gem Chubby Kid doll 12 1/2", all composition, jointed only at the shoulders, unmarked, molded painted hair or wigged, paper label on bottom of foot Gem Chubby Kid a carnival doll made by Gem Toy Company. Identify a composition Buddy Lee doll by the mark on their back: Buddy Lee in a triangle or unmarked with Lee labeled clothing) and hard plastic dolls are marked in raised letters Buddy Lee. 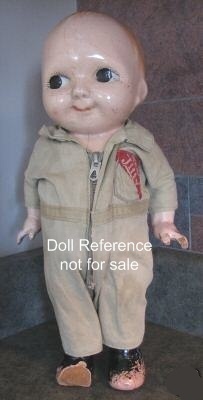 If doll is unmarked, wigged, without Lee labeled clothing, long painted eye lashes, its probably a Gem Chubby Kid doll or a similar Carnival doll. Some of the Buddy Lee outfits are; Coca Cola (white with red stripes), Football Player, Gas Station attendant, Phillips 66, John Deere outfit, The Genuine Jiffy Steamer Company, Train Engineer, Railroad worker (Gandy Dancer), U.S. Army Finance Corps cowboy, Baseball Player and there were surely others. Black Magic Buddy Lee doll, is a composition black doll with Black Magic embroidered in red or on a label along with a Lee Jeans label on his denim hat. In the 1990's a reproduction Buddy Lee doll in a Coca Cola uniform was made in white with a green stripe and possibly other outfits, too. Please Note; The H. D. Lee company never made or dressed a female doll, per Jean a doll historian for the Lee company who shared with us on August 2008. There is no such thing as a Betty Lee doll, sister to the Buddy Lee doll, sold by the H D. Lee Company in composition or hard plastic. 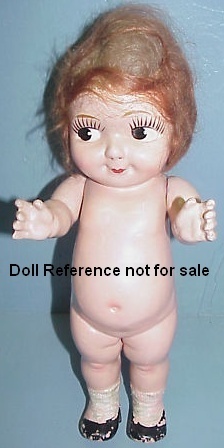 However, there are Chubby Kid dolls made by Gem Toy Company (1913-1931), as shown above left, dolls are unmarked with a paper label on bottom of the foot, usually wearing a mohair wig, dressed in unlabeled female attire and one doll has been found with the embossed triangle mark Buddy Lee on its back, with the paper label sticker on its foot Gem Chubby Kid. We believe that explains where the H.D. Lee Company Buddy Lee dolls originated, made for Lee by the Gem Toy Company. 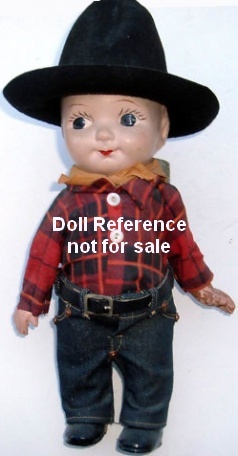 The marked Buddy Lee doll was probably old stock Gem used up, dressed and sold as one of Gems dolls. The Chubby Kid dolls are just as cute as Buddy Lee dolls, indeed they are the same doll, just don't fall for the Betty Lee doll myth.